Kayden has been selected by former World Champion Garry Kasparov as a member of the Young Stars - Team USA program, a joint partnership between the Kasparov Chess Federation (KCF) and the Chess Club and Scholastic Center of Saint Louis, which was launched to find and train the country's top emerging chess players. This sponsorship includes personal training and oversight of his chess development by GM Alex Chernin - one of the best trainers in the world. In March 2014, Kayden earned GM norm #3 at the UT Dallas Spring FIDE Open. He played against 8 Grandmasters and achieved a FIDE rating of 2477. His Grandmaster norm application was sent to FIDE to be reviewed by the 1st quarter Presidential Board 2014, Khanty-Mansiysk, RUS, 29 March - 1 April 2014 and was approved. In October 2013, Kayden scored 6.5 out of 9 at the 2013 Spice Cup. He played against 6 Grandmasters and tied for 1st place with GM Alexander Ipatov from Turkey who is the 2012 U20 World Champion. In the last round he needed a draw for the GM norm, but he scored the full point as Black against his GM opponent. Check out my debut as James Bond 007 in the Skyfall TLC Trio Music Video on Youtube above. Sign up to be a fan of TLC Trio on Youtube and visit their website here: http://tlctrio.com/. Just like former Presidential Candidate Mitt Romney, musicians and performers extraordinaire Gladys Knight and David Archuleta, talk show host Glenn Beck, former NFL MVP and 49er's quarterback Steve Young, and National Best Selling authors Brandon Sanderson, Brandon Mull and Stephenie Meyers - I am a member of the Church of Jesus Christ of Latter Day Saints (The Mormons) and I am thrilled to be so! Come find out what this is all about by clinking the link below! For a free copy of the Book of Mormon-Another Testament of Jesus Christ, click here! Who am I? Why am I here? What happens when I die? Explore the purpose of life and discover God’s plan for you through the restored teachings of Jesus Christ. Life's great questions don't have to go unanswered. Este sitio está dirigido a toda persona interesada en aprender más acerca de La Iglesia de Jesucristo de los Santos de los Últimos Días. Le invitamos a informarse sobre La Iglesia o a conocer nuestras creencias sobre la familia, la naturaleza de Dios y el propósito de la vida. También le invitamos a leer las respuestas a las preguntas frecuentes o a plantear su propia pregunta. My brother, Elder Troff, is serving an LDS mission in Jakarta, Indonesia! Shows the Gold Medal ceremony at the 2012 World Youth Chess Championship in Maribor, Slovenia. Kasparov awards the trophy and the medal. Also shows Kayden's coach GM Alex Chernin. Visitors of the World - Thank You For Visiting! Kayden was invited as a wild card to the 2013 US Championship at age 14. He was seeded as 23rd in a field of 24 participants, and after playing the strongest players in the United States he finished tied for 6th place and achieved his first Grandmaster norm. 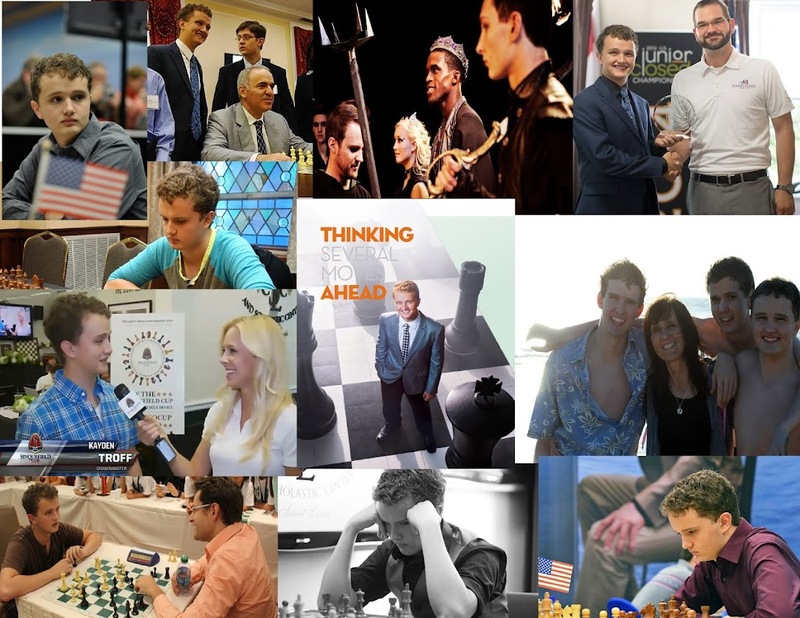 Kayden travelled with Garry Kasparov and the Young Stars to Washington DC to the 1st Congressional Chess Caucus with members of Congress on Capitol Hill in June, 2014. Kayden also had the opportunity to visit Senator Orrin Hatch and Representative Chris Stewart as a delegation of players for the 2013 US Championship travelled to Capitol Hill in Washington DC. Kayden is the 2012 World Champion U14! Representing the United States of America, Representing the United States of America, Kayden won the U14 Gold Medal at the 2012 World youth Chess Championships in Maribor Slovenia. This tournament had a record 1600 participants. There were players from over 90 different countries and 180 players in his section. Former World Youth Champion Garry Kasparov gave him his trophy and Gold Medal at the closing ceremony! We encourage everyone to become a fan of Kayden on Facebook. He now has tons of fans who can see daily messages from Kayden and follow him as he plays in the tournaments. Tell your friends we are shooting for 1000 fans by the end of January! When you arrive at Facebook click on the link "Like!"